Definition at line 84 of file tcp.h. Definition at line 85 of file tcp.h. Definition at line 76 of file tcp.h. Definition at line 79 of file tcp.h. Definition at line 73 of file tcp.h. Definition at line 81 of file tcp.h. Definition at line 74 of file tcp.h. Definition at line 82 of file tcp.h. Definition at line 80 of file tcp.h. Definition at line 77 of file tcp.h. Definition at line 75 of file tcp.h. Definition at line 78 of file tcp.h. Definition at line 90 of file tcp.h. Definition at line 94 of file tcp.h. Definition at line 91 of file tcp.h. Definition at line 92 of file tcp.h. Definition at line 93 of file tcp.h. Definition at line 89 of file tcp.h. Definition at line 68 of file tcp.h. Definition at line 71 of file tcp.h. Definition at line 34 of file tcp.h. Definition at line 65 of file tcp.h. Definition at line 62 of file tcp.h. Definition at line 29 of file tcp.h. Definition at line 28 of file tcp.h. Definition at line 31 of file tcp.h. Definition at line 38 of file event.c. Referenced by DisconnectTimeoutDpc(), FlushConnectQueue(), FlushListenQueue(), FlushReceiveQueue(), FlushSendQueue(), FlushShutdownQueue(), TCPAcceptEventHandler(), TCPConnectEventHandler(), TCPRecvEventHandler(), and TCPSendEventHandler(). Definition at line 218 of file event.c. Referenced by TCPClose(), and TCPFinEventHandler(). Definition at line 175 of file event.c. Definition at line 196 of file event.c. Definition at line 53 of file event.c. Referenced by FlushAllQueues(), and TCPDisconnect(). Definition at line 95 of file event.c. Definition at line 137 of file event.c. Referenced by FlushAllQueues(), TCPDisconnect(), and TCPSendEventHandler(). Definition at line 39 of file rostcp.c. Definition at line 104 of file accept.c. Definition at line 136 of file accept.c. Definition at line 86 of file tcp.c. Referenced by DispTdiListen(), FileOpenConnection(), and TCPSocketObject::TCPSocketObject(). Definition at line 580 of file tcp.c. Referenced by FileOpenAddress(), TCPConnect(), and TCPListen(). Definition at line 17 of file accept.c. Definition at line 150 of file tcp.c. Referenced by FileCloseAddress(), FileCloseConnection(), main(), and TCPSocketObject::~TCPSocketObject(). Definition at line 277 of file tcp.c. Referenced by DispTdiConnect(), and TCPSocketObject::TCPSocketObject(). Definition at line 387 of file tcp.c. Referenced by main(), and TCPSocketObject::~TCPSocketObject(). Definition at line 596 of file tcp.c. Definition at line 602 of file tcp.c. 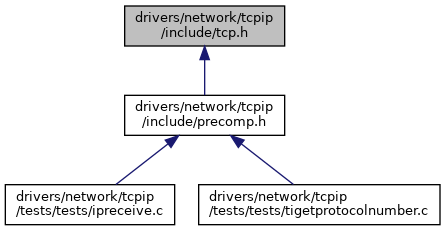 Referenced by InfoTdiQueryGetConnectionTcpTable(), TCPConnect(), and TCPListen(). Definition at line 695 of file tcp.c. Definition at line 47 of file accept.c. Definition at line 476 of file tcp.c. Definition at line 640 of file tcp.c. Definition at line 525 of file tcp.c. Referenced by DispTdiSend(), TCPSocketObject::recv(), and TCPSocketObject::send(). Definition at line 680 of file tcp.c. Definition at line 218 of file tcp.c. Definition at line 125 of file tcp.c. 133 TI_DbgPrint(DEBUG_TCP,("[IP, TCPSocket] Called: Connection %x, Family %d, Type %d, "
Definition at line 183 of file tcp.c. Definition at line 242 of file tcp.c. Referenced by TCPCheckPeerForAccept(), TCPConnectEventHandler(), TCPFinEventHandler(), TCPListen(), and TCPSendEventHandler(). Definition at line 145 of file if.c. Referenced by IPAddInterfaceRoute(), ReconfigureAdapter(), and TCPInterfaceInit(). Definition at line 81 of file if.c. Referenced by ReconfigureAdapter(), and TCPInterfaceInit(). Referenced by CallNextHookEx(), ClientThreadSetupHelper(), ClosePin(), co_HOOK_CallHooks(), EventCallback(), InsertPinHandle(), IntRestoreTebWndCallback(), IntSetTebWndCallback(), NtUserCallNextHookEx(), NtUserMessageCall(), UserFreeWindowInfo(), ValidateHwnd(), ValidateHwndNoErr(), WdmAudCapabilities(), WdmAudCloseAllMixers(), WdmAudControlCloseMixer(), WdmAudControlOpen(), WdmAudControlOpenMidi(), WdmAudControlOpenMixer(), WdmAudControlOpenWave(), WdmAudDeviceControl(), WdmAudGetMixerEvent(), and WdmAudIoctlClose(). Definition at line 24 of file tcptest.cpp.